In its simplest form the game is played as outlined below. A full copy of the rules that apply from 1st Jan 2017 are just above. The game is played as singles, doubles or triples. In singles or doubles each player has three boules and in triples two. The team that starts is decided by tossing a coin. One team member draws a circle on the ground , 35 to 50 cm diameter. The first player throws the coche 6 to 10 metres away and at least 1 metre from the boundary. He or she then throws the first boule ( both feet must remain in the circle until the boule lands ) , placing it as near to the cochonnet as possible. On small terrains it is sometimes necessary to play down to 0.5 metres from a side boundary. An opponent then tries to throw his/her boule nearer to the cochonnet or to knock away the leading boule. Then players from whichever team are not closest to the cochonnet play until they get a closer boule and so on. When a team have no more boule the other team , in turn , throw theirs. If the closest boule from each team is equidistant from the cochonnet then the team which played last plays again. 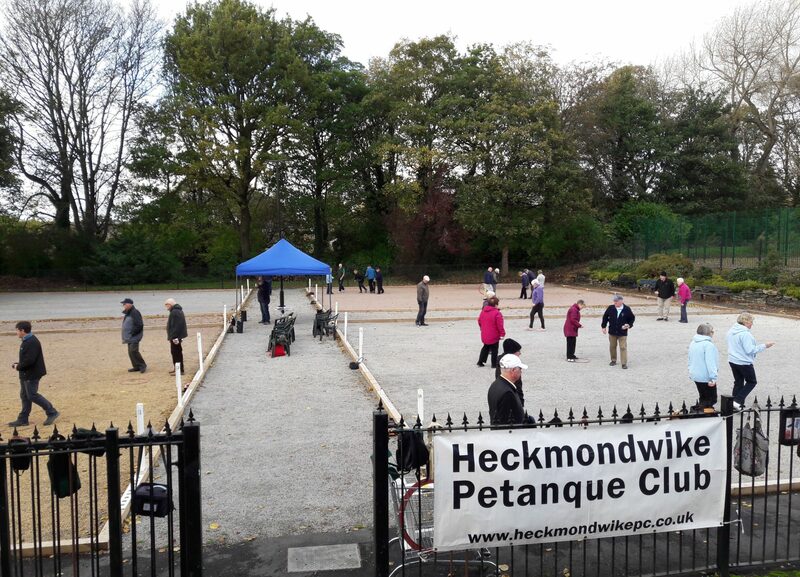 If the boules are still equidistant then the teams play alternately until the position changes. If the boules are still equidistant at the end of the game then no points are scored by either team. On a piste marked with strings a boule is dead if it completely crosses the string. When both teams have no more boules , points are counted. The winning team receives as many points as it has boules nearer to the cochonnet than the best of the opposition. If the cochonnet is knocked out of play then if both teams have boules left to play the end is void, it is also void if neither team have boules to play. If one team has boules and the other does not then the team with boules receives 1 point for each of the boules they have to play. The game continues with a player from the team that won the previous end drawing a new circle around where the cochonnet finished and throwing the cochonnet for a new end. The circle can be moved back in the line of the previous end if there is not room to play a 10 metre end.